Everything important in the item tooltip, this mount is available upon reaching Exalted reputation with Sunreaver Onslaught, it is nice to have a triceratops mount available via rep just in case you have no luck with drops. Note that with this requiring Sunreaver Onslaught at exalted, this mount will very likely be Horde Only. The Alliance counterpart to this mount is here: Reins of the Golden Primal Direhorn. I'll be honest, I'm pretty happy about getting another dinosaur mount. I always thought the raptors were really cool! Also love the fact that the Horde gets a red direhorn (the red ones are my favorite). By looking at this picture http://wow.zamimg.com/uploads/screenshots/normal/350120.jpg (its not virus, i promise :D), this mount is very big when rided by a human. Wonder how big it will be with Mr. Smite's Brass Compass + Vrykul Drinking Horn up! This combined with a Tauren and all the trinkets that increase size will make it GINORMOUS! It struck their tiny raft. To the Land of the Lost. The red ones go faster. Being as you can't fly on the island, should be able to walk on water. And the horde gets a nicer/cooler looking version of whatever the alliance gets.. as usual. Seems like the Reins of the Crimson Primal Direhorn is smaller then the ones that drops from the Zandalari warbringers. At exalted, with the guild perk, this lovely mount costs 2100 gold. This mount is deffinentely smaller then the alliance version. I've analyzed this and the Reins of the Golden Primal Direhorn is bigger then this one. Wich annoys me a little because I mostly play on my Horde. It looks like a baby compared to the Warbringer mounts. You do not have to raise your reputation across all of your characters to use this once its acquired. 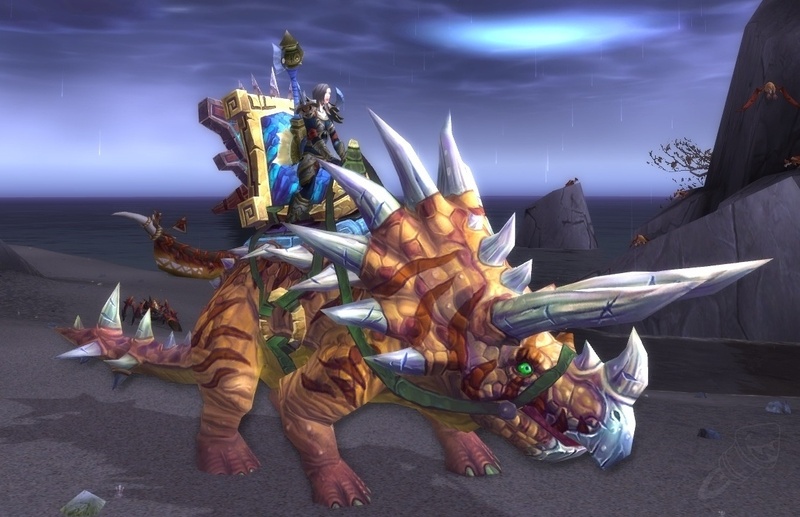 they need to make this mount and the alliance counterpart more distinguishable from the others, i'm thinking something like a horde banner or armor would be cool, and then the equivalent for the alliance one. This mount, for some reason, is slightly smaller then the other Direhorn Mounts. Imho, only Crimson, Golden and Horridon direhorn mounts look like living animals. The other 4 look like they're made of stone. So, if you're after likelifeness and not particular colour, this mount is perfect. It is also easier to obtain, because Horridon mount is a very rare drop. A great place to farm Tattered Historical Parchments for Sunreaver Onslaught reputation is through the Rogue order hall (Legion content, accessible through the Broken Isles at level 98+). The order hall is unlocked upon retrieval of the Artifact weapon. There is a man within your order hall called Winstone Wolfe, very quickly you can upgrade the Hall through him to The Vault Ticket. Sending off missions per day on the Order hall table gives you a random chance to obtain Vault Ticket as an extra reward. Handing in this quest can give you Key to the Palace of Lei Shen hanging on the wall in the room. Queueing for Troves of the Thunder King from Taoshi will provide you with Tattered Historical Parchments. These can be turned in with the Sunreaver Onslaught for Greater Sunreaver Onslaught Insignia and Sunreaver Onslaught Insignia . Remember to get the WHEE! Darkmoon Faire buff before using. "Leave it to the blood elves to pick the red one."